Very detailed Zilong Guide and Tips, How to Play Zilong and which items should you buy. Which Emblem and Battle Spells Let’s Learn Zilong now! Passive [Dragon Flurry]: Every 6s Zilong will make a combo of many small attacks instead of a single standard attack dealing a total of 1.8 times his basic damage. Hitting enemies with basic attacks will reduce the cooldown of this passive by 0.5s per attack. – This passive increases Zilong’s damage potential by a lot and you can also take advantage of it with certain items. 1st Skill [Spear Flips]: Zilong flips an enemy target to the opposite position dealing physical damage, the target will also be affected by a small movement speed debuff which will gradually wear off after 10s. – This is probably his signature skills and one of the most useful skills in the game, if you know how to take advantage of it you will be a great Zliong player. 2nd Skill [Spear Strike]: Zilong charges at a target dealing physical damage and immediately hitting him with a basic attack. The target will also be slowed by 30% for 1s. 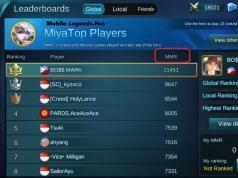 – This is a very good skill mostly used to close gaps with enemies so that you can flip them back with your first skill. Ultimate Skill [Supreme Warrior]: For 6 seconds Zilong becomes immune to slowing effect, he also gets a big movement speed buff and a 45% attack speed buff. You can also activate this skill to free yourself when you are trapped (eg Cyclops ultimate). – This is another very strong skill in Zilong’s kit because of its versatility and because of all the buffs he gets. This build relies on crits for the most part so this is pretty much a must have because of the increased crit damage. The crit % and damage it gives is also very solid. Unique Passive – Fortitude: Increases Resilience 25%. You either want to get Warrior Boots or Tough Boots depending on what kind of damage you need to counter the most in your specific situation. You don’t need other kind of boots. It has a lot of synergy with out passive, it will be easy to proc a crit to get the bonus from its passive. This will cover all our atk. speed needs. Great attack damage and lifesteal. We need this so enemies can’t counter us by building armor and our damage will be relevant vs tanks too. It will be a solid pick even if enemies don’t buy armor since every hero has base armor anyway and it will also make jungling faster and killing big objectives (like Turtle or Lord) easier. For your last item you can build a bunch of different ones to shape your build like you want to. If you want more defense vs magic damage you get Immortality (the resurrection is also amazing) like I did in this game, if you want more armor you can get something like Demon’s Advent, if you want to go full assassin you can get Blade of Despair. Starting Item: Save your starting 300g and wait until you get to 400g so you can buy Vampire Mallet (the lifesteal item you will later use to finish Haass Claws). I find that 8% lifesteal useful to have some self sustain before we buy Tooth as our 4th item. Very good because of its utility and versatility. After skill is released it will immediately remove all negative effects abd grants immunity from disables for 1s and increase hero’s movements speed by 30%. Situationally it could be better than Flicker during fights. 1) Always max your 2nd skill first, the range increases with each skill point and for that reason it’s extremely important to make its range bigger asap. 2) Standard engage combo: 2nd Skill from afar to get on top of the enemy + 1st Skill to pull him back on the other side (if we have allies we will bring him closer to them, if he wants to escape he knows has to run for a longer distance). 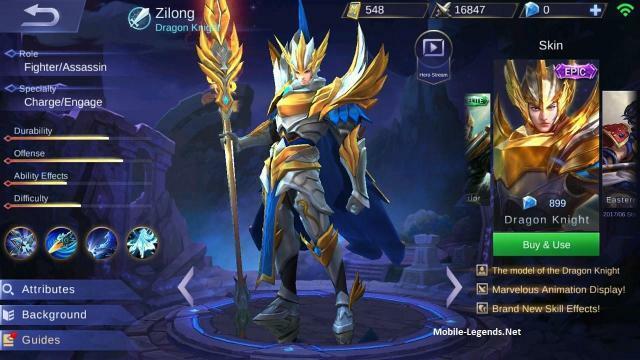 3) Zilong’s 1st Skill is amazing and it can be extremely useful, you can use it aggressively like I explained in 2) for example or to pull enemies under your tower if they get too close. You can also use it in a defensive way to save teammates by pulling enemies away from them. Master this skill and you will be a great Zilong player. 4) Your 2nd Skill keeps following the target if they move while you are still charging, always keep that in mind vs heroes with high mobility. 5) If you are running Flicker you can use it in aggressive ways to close big gaps fast and flip the enemy back with your first skill. 6) Activating your ultimate can free you from certain kind of CC, for example if you get trapped into Cyclops’ Ultimate activating your ultimate while in the prison will immediately free you from the prison! 7) You ultimate is a great tool, it can be used to escape (if they don’t stun you immediately it will be extremely hard for them to catch up to you) and to engage fights. If you use it to engage try to activate it as late as possible so you don’t waste too much of its duration. 8) Blue buff is nice on Zilong mostly because it allows you to use your ultimate everytime you want making it have only a couple of seconds of downtime, you are not an high priority Blue buff carrier though so if needed save it for your other allies. Red buff is nice on you so if you have a chance get it. 9) With this build you will be able to do Turtle and Lord very fast once you get Scarlet Phantom, keep this in mind and take advante of it if you can. from “Mindereak” thank you for sharing.